We have a tonne of recipe books, some we use all the time and some we use very seldom. For this reason we try to go to the shelves and deliberately choose something we haven’t cooked from for ages, or indeed never. This is how we ended up cooking this gammon dish, as Nigella Express has been neglected since well before Jono and Jules even met. Since 2007 to be precise when Jules cooked some cocktail sausages in honey, soy sauce and sesame oil and wrote “28.10.2007 Too sweet! !” beside the recipe. The comment beside this recipe is, “5.8.11 Really good!! Serve with new spuds + peas w/ Parmesan + cream” – which is much more positive and so we thought we would share it. 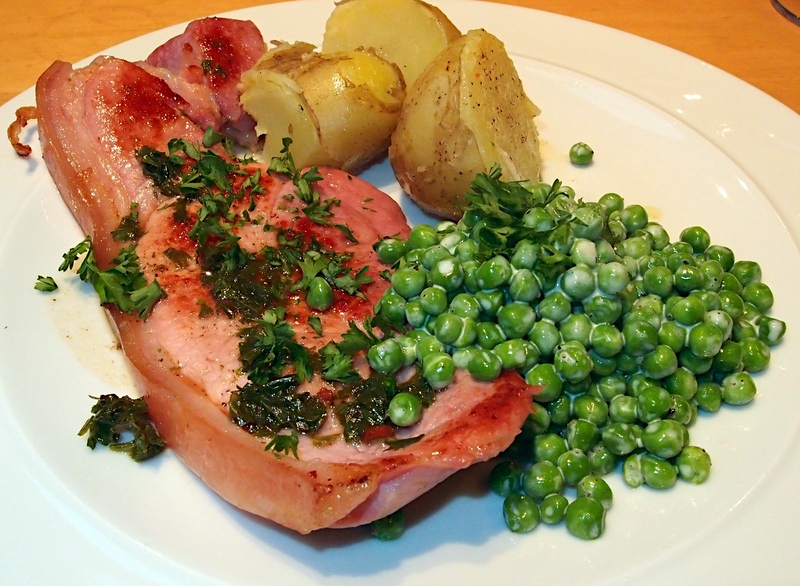 Heat the oil in a large, heavy-based frying pan and cook the gammon steaks for about 3 minutes on each side. Remove and keep warm. Take the pan off the heat. Whisk the vinegar with the water, pepper and honey and throw into the hot pan along with most of the parsley. Stir to mix and make sure you scrape all the sticky bits of the bottom of the pan, then pour over the gammon steaks. Sprinkle over the remaining parsley and serve. P.S. Nigella suggest serving this with some frozen peas blended with a little Parmesan, pepper and Mascarpone. We blended ours with some Parmesan, pepper and double cream as that’s what we had. Wine Suggestion: Pick a lightly oaked and well balanced Chardonnay – you should get a wine with freshness and minerality as well as lovely ripe fruits and a good structure to hold it all together. If the wine is well made it won’t be too forceful rather it will have a structure to support and compliment the food. We drank the William Cole Columbine Reserve Chardonnay from Chile which went down a treat; really great value at €13.50 in Mitchells. That is a beautiful plate and a perfect recipe! Glad I saw you at Joshua Fagan’s blog!